Introduction: Adjustable gastric banding has become the operation of choice for bariatric surgery. Following operative placement, close follow-up with adjustments of the band are essential for optimal weight loss. Defining the optimal volume of an initial fill may minimize the cost associated with fluoroscopic guidance and create a guidepost for inexperienced surgeons. The newer AP band features a full 360 degree inflatable ring, which may alter adjustment volumes. Methods: All adjustments were performed under fluoroscopy to ensure accuracy. All patients swallowed barium at the time of the fill to ensure no overinflation occurred. Fill volumes were recorded. Results: For the Inamed VG band (n=35), the initial first visit fill was 3.5 +/- 1.5mL. 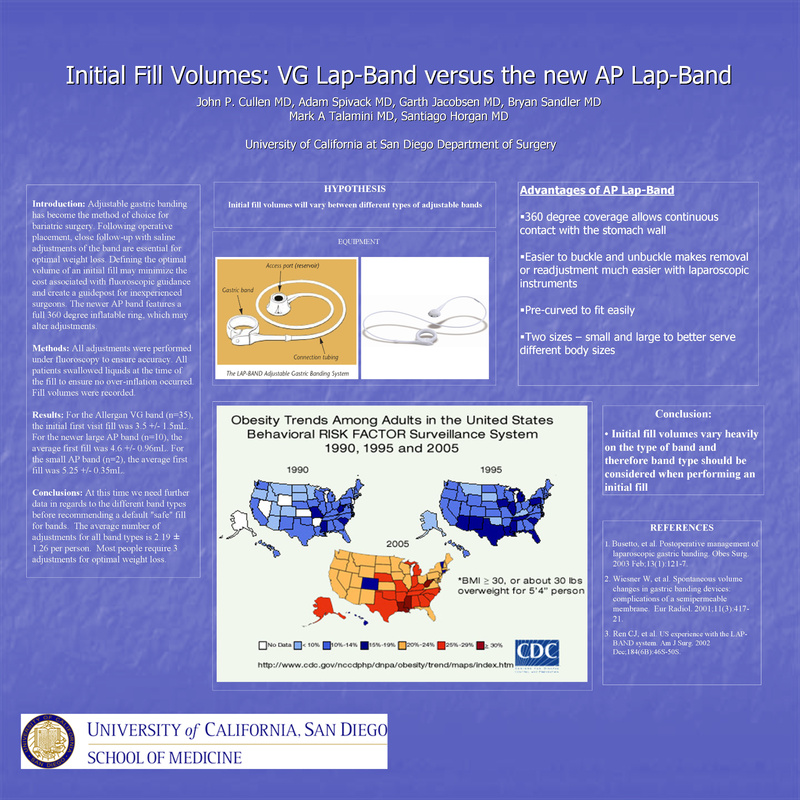 For the newer large AP band (n=10), the average first fill was 4.6 +/- 0.96mL. For the small AP band (n=2), the average first fill was 5.25 +/- 0.35mL. Conclusions: In our initial experience, the AP needs 1.1cc more saline at the time of the first fill. This is important to avoid underfilling in patients who have received the new AP band.